Cosmetic Dental Bonding | Chris M. Herman D.D.S. Cosmetic dental bonding is the application of a tooth colored resin material that adheres to the tooth using a high intensity curing light. Dental bonding gets it’s name bonding due to the process of bonding the material to the tooth. Cosmetic dental bonding can dramatically enhance your smile. Cosmetic dental bonding can correct a tooth gap, cover spots, chips, and discolorations, repair fractures, and even re-shape teeth. It is also great for an instant repair of a broken front tooth. Roughening the surface of the tooth. Applying a tooth color composite resin adhesive that closely matches the existing color of our tooth. Shaping the putty-like resin into the desired shape. Polishing to match the shape and surface of the surrounding teeth. After the material has hardened, Dr. Herman will then further trim, shape and polish the bonding to make it match the rest of your mouth’s structure. One of the many advantages to dental bonding is that it usually takes only one visit to complete. 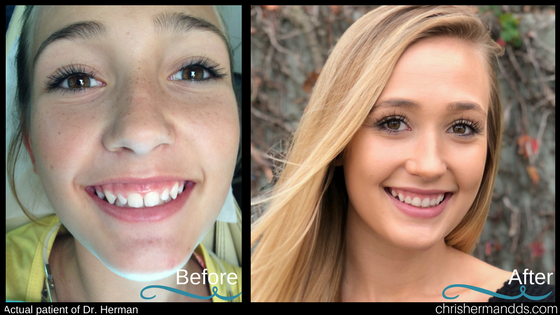 *To see more patient before & after pictures, check out our Smile Gallery.